Type foundries are foundries specializing in casting fonts, mainly in metal, for the printing industry. Now metal fonts seem to be a thing of the past, type foundries prepare fonts in digital form, using digital, i.e., electronic tools, hence the term e-foundry. GUST is very active in TeX related font (type) activities. It arguably is one of the main digital font foundries for the TeX community, so e-foundry seemed an appropriate name for the activity. 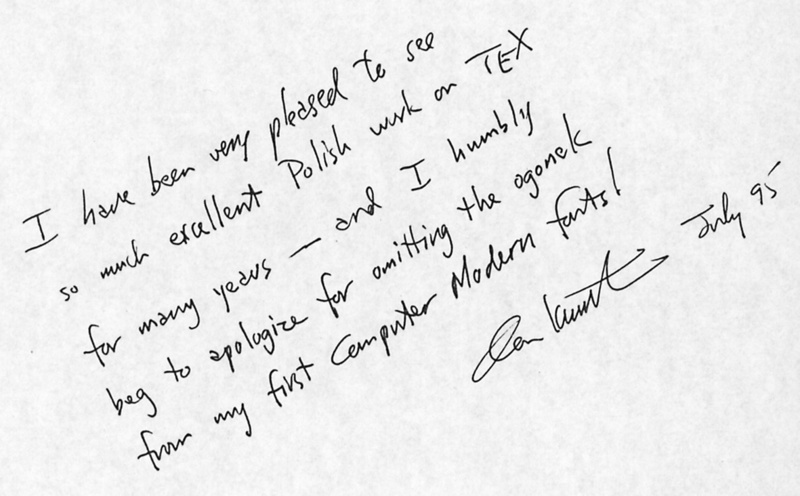 The Latin Modern (LM) family of fonts is expected eventually to replace Computer Modern, the first family of fonts designed by Donald E. Knuth for TeX. LM, in its Type 1 format implementation, contains a full set of mathematical fonts inherited from the Computer Modern fonts and is enhanced with diacritical characters for almost all scripts based on the Latin character set. However, the LM in OpenType format implementation does not allow for serious typesetting of mathematics. For that, Latin Modern Math fonts (LM Math) fonts are required — Latin Modern and LM Math links will get you to the relevant resources, provided directly by the team members. The project team uses the METATYPE1 technology for development. This is here where GUST's e-foundry guys, Bogusław “Jacko” Jackowski, Janusz M. Nowacki aka “Ulan”, Piotr “PSotruś” Strzelczyk and Marcin “Teufel” Woliński are delivering fonts developed by them for the “New Font Project: TeX Gyre”. The project is funded by DANTE e.V., NTG, TUG, CS TUG, TUG India and GUST. The fonts are a thorough rermake of the freely available fonts distributed with Ghostscript ver. 4.00. Thanks to the URW++ company since 22nd June 2009, the base fonts are available under LPPL, the LaTeX Public Project License. For more information and download please follow this link. You might be interested in the papers available from that page. As is it is the case with the Latin Modern OTF fonts, TG OTF text fonts alone are not sufficient for typesetting advanced mathematical papers, and for that the e-foundry provides TG OTF Math fonts. The TeX Gyre Math link will get you to the relevant resources, provided directly by the team members. Also is this case the METATYPE1 tool chain is used for development. This is a two-element antiqua typeface designed by a Polish typographer Adam Półtawski (1881–1952). A digitized version of this typeface is available in the regular, regular italic, bold i bold italic variants and in five width (or size, or design size) variants, namely, expanded, semi expanded, regular, semi condensed and condensed (or 6pt, 8pt, 10pt, 12pt, 17pt). Altogether there are 40 font files, available in the PostScript Type 1 and OpenType formats. The fonts are being developed by Bogusław Jackowski, Janusz M. Nowacki and Piotr Strzelczyk. The project was started way back in the late nineties of the last century by Janusz M. Nowacki. For more information and download please follow this link. Alternatively, you may want to visit Janusz M. Nowacki's web page. There you can check this and other fonts live by visiting the prominently framed link named “Font sampler”. Please note that with the release of the enhanced version (available from the download page), the preliminary Antykwa Poltawskiego package (antp) as published in 2000 has become obsolete. Already since 1996 Janusz M. Nowacki develops a digitized version of Antykwa Toruńska. This two-element antiqua typeface was designed by a well-known Polish typographer Zygfryd Gardzielewski (1914–2001). More information and downloads are available from Janusz M. Nowacki's web page. Non-serif fonts: Kurier and Iwona. Kurier was designed in pre-computing times by Małgorzata Budyta, digitized and extended by Janusz M. Nowacki. He went on to design Iwona, which is very firmly based on Kurier. Iwona is named after his daughter. More information and font files download on Janusz's page. A high-contrast, 2-font sans-serif family based on the slanted original designed around 1920s by “Odlewnia Czcionek J. Idźkowski i S-ka” type foundry in Warsaw. Digitized, extended with a complete set of diacritical characters and some glyphs not available in the original by Janusz M. Nowacki. Moreover, Janusz re-constructed the complete upright variant from the surviving only 11 glyphs shown in a book on typesetting technology. More information and font files download on Janusz's page. The Quasi collection is a set of polonized variants of the very popular fonts from the Ghostscript distribution. The polonisation, partly sponsored by GUST, was done by Bogusław Jackowski, Janusz M. Nowacki and Piotr Strzelczyk. The collection contains six familes. All GUST e-foundry's fonts are or will be licensed under the GUST Font License (GFL), which is legally identical to the LaTeX Public Project License, see the details. One should however note that licensing of the TeX Gyre fonts under the GFL has become feasible only after the URW++ company allowed the distribution of the 35 base Postscript fonts as shipped with GhostScript 4.00 to be also governed by the LPPL. This happened on the 22nd June 2009, with the personal involvement of Dr. Peter Rosenfeld, URW++'s manging director. The main tools the e-foundry team uses is METATYPE1. Its newest official version might be obtained from CTAN.